Mahdia is a place that I have been looking forward to visiting for some time. 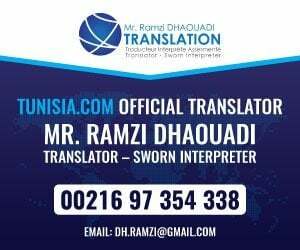 Mahdia has a ‘lazy town’ reputation, a town where time stands still even in Tunisia where relaxation is a national sport. However to just dismiss Mahdia as fishing viliage would be hasty as this is a former Fatimid capital has plenty to justify a visit. When you arrive in Mahadia, you will most likely be staying in the zone touristique or Tourist Zone which is a area assigned to hotels and touristic activity along the beach and the location of the 5 star and package hotels. This area during my visit seemed to be undergoing significant investment with new hotels, real estate and facilities which now make the corniche reach from the old town ‘Medina’ to the new hotels. Given the long beach and the land available, it looks like Mahdia has large plans for expansion and the lack of development has allowed the new buildings to be more modern and high density in comparison to other costal towns, whereas the corniche is mostly houses. There is a lot being built so finding a sea view apartment here is not going to be a problem in a few years and many local investors are assuming an influx of new tourists. When you go down the Corniche, you cannot help but notice something unique about Mahdia. The Medina is infront of you the whole time on what is a peninsular, infact where you are standing is all new and the historic centre of Mahdia was self contained on the land jutting out infront of you. Over the centuries the town has branched out from here and the location provided an excellent defensive proposition. It may seem small now but during its heyday Madhia was the Fatimid capital or North Africa and the successful home base that led to the conquest of Cairo which then ultimately led to the cities demise as Cairo took over as the capital of the Fatimid empire. In 916AD, Obeid Allah, the Fatimid Caliph started what would be the Golden era of Mahdia until 947AD. However, Mahdia was a rich regional city until the 14th century. The Fatimids where Shia muslims which for those who do knot know means that they are not of the Sunni side of islam the reasons for the divide were down to the disagreement of succession after the Prophet Mohammed PBUH where the Sunni believed in succession by seniority the Shia believed rulers should be Ahl al-Bayt (“the People of the House”) ie relations of the Prophet PBUH. Importantly the Fatimids weere Arabs and thus the largest Arab empire. The image below shows the scale of their influence though note that Cairo is listed as the capital, before this it was Mahdia. You can drive around the edges of the peninsular if you like but Mahdia is best approached as if you where arriving all those years ago and entering via the Skifa el-Khala or “Large Dark Tunnel/Passage” This magnificent gate sits at the narrowest point where the peninsular meets land and unfortunately has lost its walls which at circa 10 metres thick would have connected to the sides and then cut off the narrowest point where the peninsular meets land. This Fatimid construction was built to be attacked not to be flash, and would have been the only way into the town and the tunnel used to have a number of portcullis allowing the defenders to keep the invaders under fire, behind this gate would have been a secondary wall which is the one that surrounds the peninsular the ruins of which you can see in later photos. 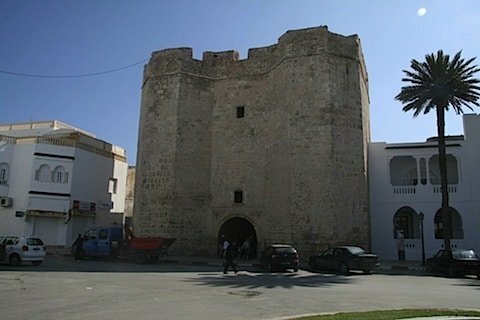 Once inside the walls, you see that Mahadia is very nice with small streets in all directions and a relaxed and clean ambiance which is in contrast so some old towns in Tunisia where you feel that those living inside show little love for their historic surroundings. Mahdia also has little squares with coffee shops which have a lovely canopy of trees and at thime of writing (March) this was being made use of by locals and visitors alike. A famous such place is the Place du Caire (photo below) which has a cool ambiance and the lovely doors of the Mustapha Hamza Mosque. This use of trees is to be commended as it gives a coffee in Mahadia a special feeling of relaxation. My favourite square is the one opposite the rebuilt grand mosque and sitting down actually got cafe envy as the business there must be fantastic this is called the Place Khadi en- Noamine. The Mosque has obviously been totally rebuilt and presumably has been returned to practical use though when I tried to go in the prayer hall was closed. I also assume that a few hundered years ago almost all the citizens of the town could have fitted in during Friday prayers this is a very large prayer area. Opposite the grand mosque there is also a lovely smaller mosque which has a nice design and is well looked after. Next to the Mosque also laughed at a little reminder that people still actually live in the Medina and not that the Fatimids loved their home entertainment. Mahdia is also famous for its doors or door frames to be exact unlike many towns in Tunisia where it is mainly the wooden door which is the star. Here is a Flickr slideshow of some of the best doors found by visitors. A great feature of the medina is that almost every street that you go down ends up opening up to the sea this gives the town a very healthy feeling and you do walk around wondering if people live to 130 years old here. A good place to have a coffee during a walk around is the cafe Sidi Salem which lies between the Mosque and the Fort and offers a great view. The BIG fort is well named as it is just that a lovely imposing solid fort that in contrast to Monastir where the Ribat was added to over time, the fort remains a clean example of the 16th century structure. 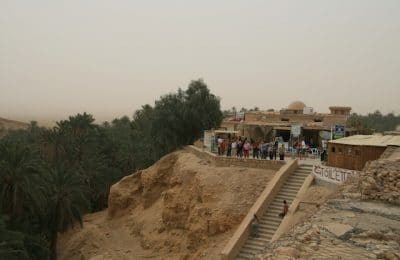 At the time of writing March 2009 the entry fee for the fort was 4 dinars +1 dinar for bringing a camera which is ok for foreigners but expensive for Tunisians. I hate the camera charge especially as these days photos are free advertising on social media and internet! But if you have a small camera and not the bazooka I had, whip it out later and blag it as the best views are from the top of the fort. The inside of the fort is pretty plain, however, it is lovely still and as a structure it does what is says on the tin – a fort with a garrison which has a thick wall, great position and space inside for drills. There are some great views from the top of the walls, the little huts on the corners of the walls are apparently a later addition to the structure. Below is a slidewhow of some of the other images that I took of the fort. My unexpected highlight of Mahdia was not the gate or the fort but the beautiful and disorganized graveyard that rolls across the entire tip of the Peninsular. Not only does that graveyard have a wonderful first line view of the sea but is also has a road winding through it and also has both the ruins of the old city defenses, a Fatimids port and a nice lighthouse. The graves start aside the fort. And reach all the way to beyond the lighthouse. You actually do have to be careful not the step on graves given the proximity of the walkways however this does not stop tourists locals and relatives of the dead walking through this sombre but delightful place you feel that everyone here wants to be buried in this place. In the graveyard, there is a perfectly formed little port which is still in use by the local fisherman. It may not be as protected as it once was, but you can clearly see the ability of the Fatimids to cut out a port in the peninsular and also cut a channel in from the sea. Above is the channel that connects the sea to the port. At the entrance to the port and dotted around the coast of the peninsular you can see the remains of the wall that protected the city. It is important to remember that in Fatimid times only the Caliph and his entourage would have been allowed to live in the city itself. The above archway in particular some 25m from the port invokes a image of the city at its zenith you can imagine the large walls. Once you walk beyond the lighthouse you are at the end of the peninsular or Cap Africa and you can then go round the other way and walk back into town though be careful for usual bad drivers coming too fast. Mahdia is a lovely place if your looking for some History, relaxation and a healthy location to wind down this is it. Also it looks like over the next few years there will be further investment in accommodation, hotels and things to do which will make a holiday here even more attractive. If you have teenagers then maybe the lack of nightclubs and attractions may put them off but for the romantic in you this hits the spot. And the general Flickr Feed for photos of Mahdia.